Marvel Super Heroes unite in this Marvel Heroes Unite! Ultimate Sticker Collection Book! Fans of all ages will learn fun facts about their favorite Marvel superheroes and villains' powers, alter egos, and battles as they play with more than 1,000 colorful stickers. Whether it is placing the stickers in their correct scene or creating battles of their very own, the Marvel Heroes Unite! 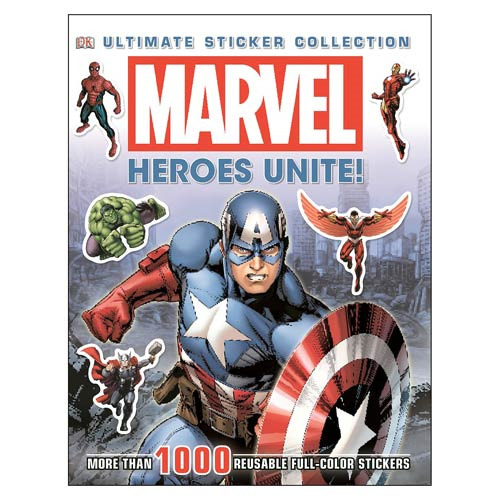 Ultimate Sticker Collection Book will be perfect for the ultimate Marvel fan. Measures approximately 11 1/2-inches tall x 8 1/2-inches wide. Recommended for ages 5 and up. Spans 96 pages.